An extensive write up about ways to keep your data ‘squeaky clean’ by way of integrity constraints. There’s a lot to learn from here. PostgreSQL 10 promises an easier partitioning mechanism to help scale for big data. But how does that compare to TimescaleDB for time-series workloads? Train to build custom apps fast and effectively. 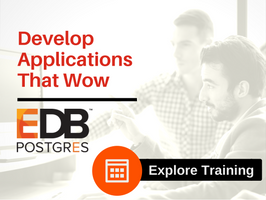 Access comprehensive training for app development with Postgres from the industry’s most credible source for Postgres Developer Training, EnterpriseDB. Explore EDB’s developer courses. POWA is a Postgres ‘workload analyzer’ for monitoring and tuning your Postgres setup. Training and talks in New York on Nov 6 and 7, with another day of talks in Chicago on Nov 9. Use code Cooper_40 for a 40% discount on both general admission and/or training. A quick visual overview of Postgres’ MVCC model. An interesting tale of a Postgres bug that was fixed in August. This company couldn’t migrate entirely to Postgres, so ran it in parallel with RethinkDB. A brief overview of some favourite developer-focused features in Postgres 10. In this book, you’ll learn how to find, evaluate, and improve the queries running on your database servers. Works with SQLite, MySQL and Postgres.